Get better visibility and communcations on important logs and events through e3’s e-logs and shift handover module. Tracking the major events that happen on a shift is one of the basic disciplines for a team that communicates well. Having the ability to record and action anything of note as it occurs, at the time it occurs and providing detail of any occurances as a result becomes a seriously valuable resource both during the shift and at shift handover. 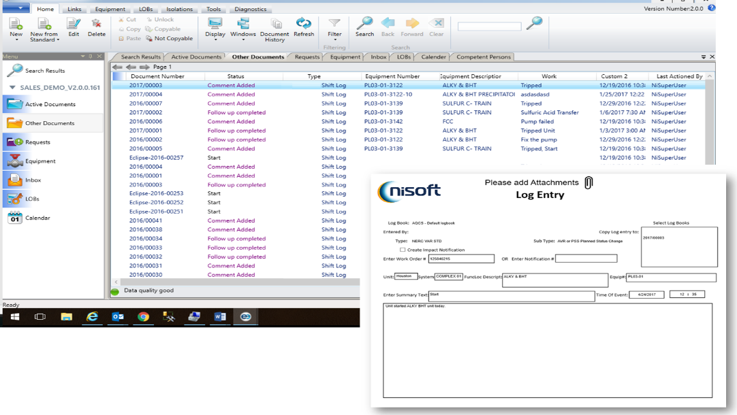 NiSoft have incorporated into e3 the ability to create logs of events on shift, that permits regular data entry that you would expect but also feeds the permit and isolation activity into a report. As well as providing insight into the current state of the plant and enhancing communication at shift handover, it also provides teams with a historical view of operational information in the event of a incident. Shift handover becomes are more more simplified and streamlined process in e3, by giving the ability to produce a tailored report for your facility that captures the important data recorded by operations on shift, and also the permit and isolation activity which is invaluable to the team taking over the shift and plant.